Large scale investments in fertilizer production are a rarity in sub-Saharan Africa. As such, the African agriculture sector watched with great interest when, in early November, Morocco’s OCP Group, the world’s leading phosphate exporter, signed a US$3.7 billion deal with Ethiopia’s state-owned Chemicals Industries Corporation (CIC) to build a fertilizer plant in Ethiopia. The country, currently a net importer of fertilizers, would be home to one of the largest fertilizer complexes in the world, which is projected to satisfy the entirety of the local demand with enough left for export to regional markets. The plant will take half a decade to begin production, so it is not quite time to celebrate yet. Still, increased regional production could help address the issue of high fertilizer prices in sub-Saharan Africa, which uses significantly less fertilizer per hectare than the world average. Globally, across all crops, farmers apply 135 kg of fertilizers per hectare of arable land, while in sub-Saharan Africa that figure is closer to 17 kg. Although Sub-Saharan Africa has nearly 20 percent of the world's arable land, it consumes around only 2 percent of fertilizers. Smallholder farmers make up 70 percent of the population in sub-Saharan Africa, and their productivity is held back, in part, by high fertilizer prices. Although fertilizer usage in the region has grown in recent years, a variety of factors keeps application rates in Africa low—in particular logistics costs and limited domestic production. That is why efforts to reduce the costs of shipping fertilizers in Africa, as well as greater investment in production, should be welcome news for the continent. Fertilizers come in different compounds and blends. Compounds are chemically processed to have all the specified units in one granule, while blends are a physical mixture of different minerals and nutrients in customized proportions. Blends tend to be cheaper but less consistent in quality. Producers in sub-Saharan Africa use more urea than any other type of fertilizer because it is one of the cheapest sources of nitrogen. (Along with phosphorous and potassium, nitrogen is one of the three components of mineral nutrients.) The region consumes nearly 3 million tonnes of urea annually, and it makes up more than 40 percent of its total fertilizer consumption. The second-most popularly consumed fertilizer in Africa is NPK, a term applied to a wide variety of fertilizer blends and compounds that are composed of a combination of nitrogen, phosphate, and potassium. 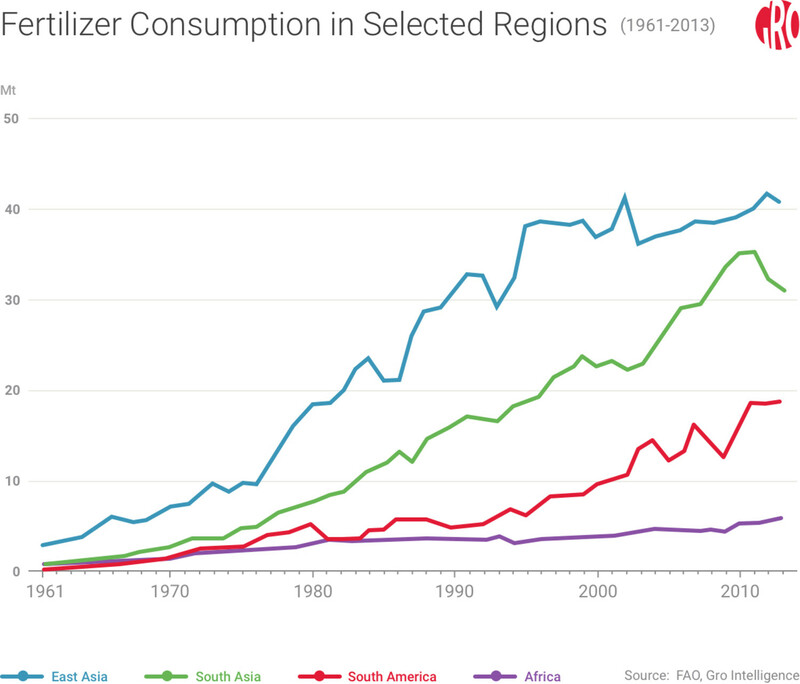 Fertilizer application rates in sub-Saharan Africa are low relative to the rest of the world. In 2006, average fertilizer use in Africa was about 8 kg per hectare—a tenth of the global average. In that same year, African Union member states met in Abuja, Nigeria and adopted the “Abuja Declaration on Fertilizer for the African Green Revolution,” pledging to increase fertilizer use to 50 kg per hectare by 2015. Over the last few decades, policymakers linking low fertilizer use to low yields, have attempted numerous interventions to promote fertilizer use across the continent. Yet in spite of the Abuja Declaration and its lofty aspirations, the average fertilizer application rate in Africa today still languishes between 13 and 20 kg per hectare. Africa consumes significantly less fertilizer than South America, South Asia, and East Asia. Due in large part to low fertilizer use, crop yields in sub-Saharan Africa are significantly below that of other regions. As an example, average maize (corn) yields in Kenya are about a sixth of US yields. Although sub-Saharan Africa dedicates nearly as much land to growing corn as the US, it produces a sixth of US output. 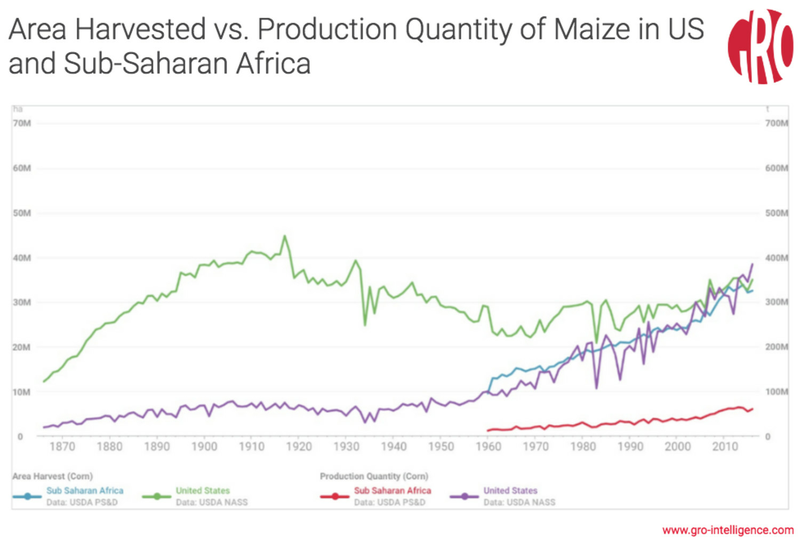 Although sub-Saharan Africa dedicates as much land to corn production as the US, production significantly lags. Increasing fertilizer use would help to close the gap. The high cost of fertilizers in sub-Saharan Africa restricts how widely they can be used. A 2011 study found that fertilizer costs in sub-Saharan Africa were at least four times more expensive than they were in Europe. 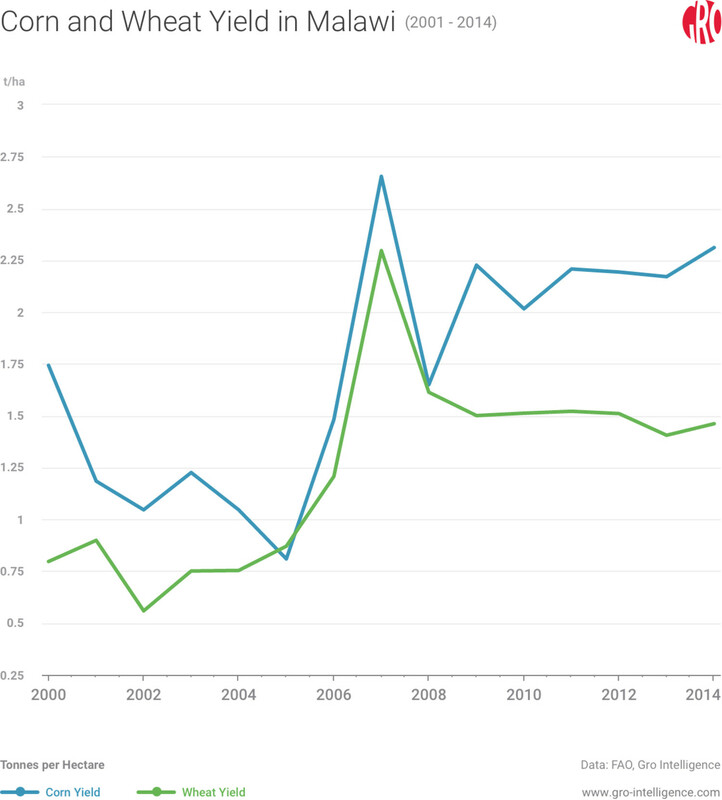 Even more troubling, studies have shown that while global fertilizer prices have fallen in real terms, that trend hasn’t been reflected in sub-Saharan Africa. Country-by-country data shows widely divergent fertilizer use rates. One World Bank study found that imported fertilizer inputs in Zambia cost 30 to 40 percent more than in Thailand. Another report found that a bag of fertilizer in Uganda could cost local farmers double the sum paid for by farmers in the United States or Europe. Among other challenges, the cost of transport is a major factor that makes fertilizer prices high. As Grace Chilande of the International Fertilizer Development Center (IFDC) tells Gro Intelligence: “Fertilizer is a logistics game.” Because domestic production of both fertilizer compounds and blends are very limited, most of these nutrient inputs need to be transported across great distances. There are two major transportation costs involved in getting fertilizer to sub-Saharan African countries: ocean shipping costs and inland trucking and rail costs. Both are higher than in other regions of the world. On the ocean side, limited port capacity means that importers must use smaller vessels, which increases the landed costs per container or tonne. At the port, poor infrastructure slows the rates of discharge, which increases congestion and raises the risks of demurrage costs on shippers. Limited numbers of warehouses, aged cranes, and other port issues prevent the swift discharge of goods. 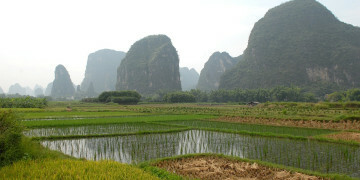 On land, limited rail infrastructure and poorly-maintained roads make it difficult for goods to reach inland countries. Almost as important, governments impose a considerable number of checkpoints on trucking, so that truckers must pay many fees and bribes. A 2011 study found that the retail cost of fertilizers increases proportionately with distance; urea was significantly more expensive in western Kenya than the port city of Mombasa, and almost twice as expensive in landlocked Malawi. Although regional agreements have reduced the costs of some cross-border fees, they haven’t been abolished completely, and in many places they’re still very high. Fertilizer production on the continent has also been difficult because, importation of raw materials is costly. Production is also governed by strict regulations. Tanzania, for example, requires three years of trials with the Tanzania Fertilizer Regulatory Authority before a firm can begin production. While trial periods are less in other parts of sub-Saharan Africa, they are usually substantial enough to limit production. The costs of fertilizer production on the continent are also high because nitrogen fertilizers in particular require a great deal of energy to produce. 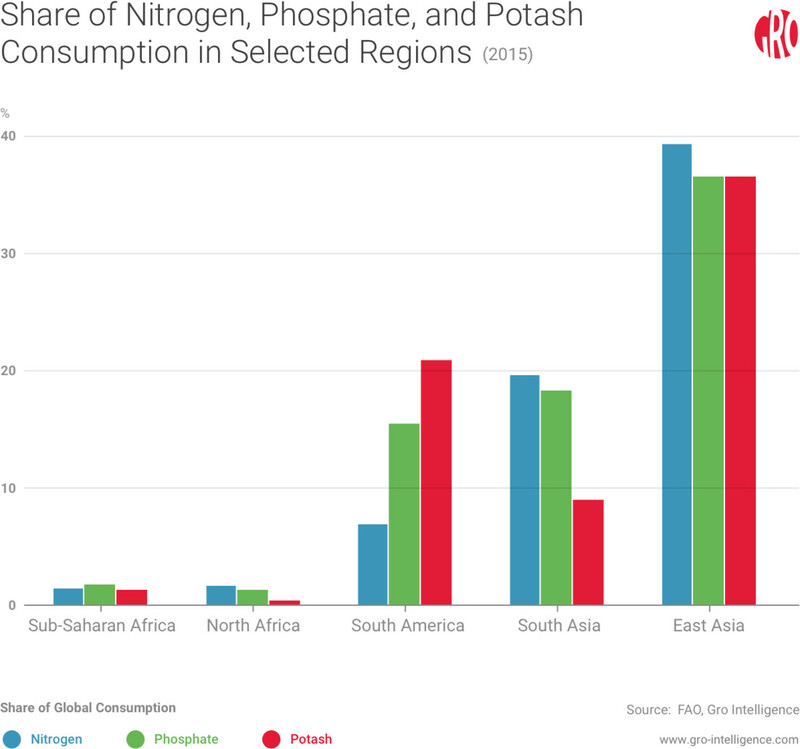 Nitrogen fertilizer production alone accounted for 2 percent of global energy demand in 2014. In a region where electricity is expensive and not always reliable, energy is a limiting factor for domestic fertilizer production. A study found that in Nigeria, fertilizers were so expensive that the benefits of using them were outweighed by their cost. Governments have responded by creating subsidy programs, but their effectiveness has been mixed. Fertilizer programs that were popular in the 1980s had been mostly phased out by the 1990s. Malawi is a country that has gone especially far in extending fertilizer subsidies. The country spent massively on its fertilizer subsidy program starting in 2005, with the program taking up 13.5 percent of the national budget by 2009. In those five years, fertilizer use in the country nearly doubled; among other increases, it more than doubled the yield of corn. 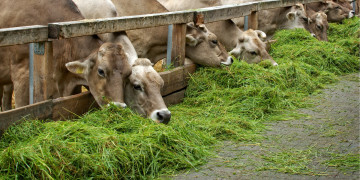 However, as the country tightened its budget, the government substantially cut fertilizer subsidies. While Malawian corn yields held steady for a few years, they’ve fallen nearly 40 percent since 2014, due to a mix of reasons, including El Nino and fertilizer cuts. Malawi ran an extensive fertilizer subsidy program, but cut back in recent years after costs ran too high. Corn and wheat yields have declined more recently, due to weather problems and fertilizer cutbacks. Nigeria is another country that cut back its fertilizer subsidy programs. In 2012, its agriculture minister estimated that as little as 11 percent of subsidized fertilizer was actually passed through to smallholder farmers at the prescribed price. Instead, much of the fertilizer had gone to middlemen, who resold it at market rates. While subsidy programs have had success in increasing yields, they have often been too expensive or poorly managed to help farmers on a sustained basis. Although subsidies can help reduce the costs of fertilizers, they can also discourage the formation of a vibrant domestic fertilizer industry. Instead, countries may do better by targeting transportation costs, which would ensure better distribution to more farmers. In a study focused on Nigeria, the World Bank found that reducing transportation costs by 50 percent would increase the number of plots with profitable fertilizer use by 40 percent; if costs fell by 75 percent, then the number of plots could increase by 60 percent. In addition to lowering the costs of transportation, the region is looking at different ways to improve production. Current sub-Saharan African fertilizer plants tend to be small, and thus they can’t easily reach the same economies of scale that larger overseas plants enjoy. They also tend to have to import raw materials at higher costs than other parts of the world. By reducing the costs of sourcing raw materials, countries may be able to raise the levels of domestic production. Local companies are starting to find more success in sourcing raw materials from within the continent. Businesses have been acquiring urea from natural gas reserves in Nigeria, Egypt, and more recently, Gabon. They are mining phosphate in Mali, Senegal, Togo, and soon Uganda. And they are manufacturing nitrates from ammonia sources in South Africa and Zimbabwe. These raw materials are making it possible to produce custom blends and compounds on the continent. The OCP-CIC fertilizer joint venture in Ethiopia is a prominent example, and a hopeful sign that the region will produce more fertilizer. The OCP Group claims that the plant is expected to produce around 3.5 million tonnes of fertilizer a year when it reaches peak production in 2025. That’s considerably more than the 0.7 million tonnes Ethiopia is currently consuming per year and the 1.2 million tonnes that the International Fertilizer Development Center has suggested the country should be applying to maintain optimal soil conditions. In addition, there are several other examples of investments in fertilizer production on the continent. Toyota Tsusho has built a large new fertilizer plant in Eldoret, Kenya; it will focus on producing fertilizers that are customized for regional soil types and local crops. Like Ethiopia, Kenya currently imports nearly all of the fertilizer it consumes, around 600,000 tonnes a year. The Toyota Tsusho plant is expected to reduce the country’s imports by up to 25 percent. Africa wants to usher in its own Green Revolution, and raising fertilizer application rates will be one of the main drivers. To increase fertilizer consumption, the costs of fertilizers, among other factors, needs to come down substantially. The region is expected to significantly increase demand for fertilizers over the next decade. The FAO’s World Fertilizer Outlook report projected that of all world regions, sub-Saharan Africa will see the fastest growth in fertilizer demand between 2014 and 2018; at 4.7 percent, this rate is much higher than the world average of 1.8 percent. To increase fertilizer use to the levels of aspired to by the Abuja Declaration, there will have to be a meaningful increase in regional production and lower transportation costs. There are hopeful signs on the production front. In addition to greater investments from major producers (like the OCP Group and Toyota Tsusho), governments and NGOs are also promising capital. At a meeting of the Alliance for a Green Revolution in Africa organization in October 2016, various groups pledged over $30 billion to transform agriculture over the next decade. These funds are directed towards significant efforts to modernize production efforts and to bring more fertilizers to farmers. Which Countries Have a Protein Shortage in Their Future?